Jack Bevan's remarkable translation of Quasimodo's entire poetic oeuvre (Anvil, 1983), redesigned and reissued in 2017. Salvatore Quasimodo (1901–1968) was awarded the Nobel Prize in 1959 for 'his lyrical poetry which with classical fire expresses the tragic experience of life in our time'. 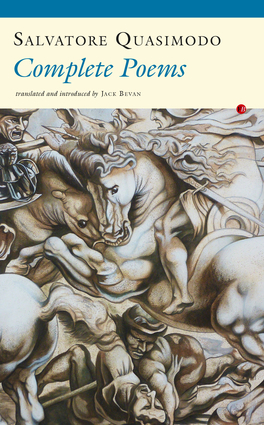 Jack Bevan's remarkable translation of Quasimodo's entire poetic oeuvre fills a great gap in our knowledge of twentieth-century European poetry. 'The poetry is textured like shot silk, yet the elegance and syntactical lucidity with which Jack Bevan has worked to bring these poems to English readers enables them to stand as poems in their own right', wrote Peter Scupham of Bevan's translation of Quasimodo's last poems, Debit and Credit. Quasimodo's strong and passionate poetry continues to testify to the human – and inhuman – realities which have created our modern world: as the Italian critic Giuliano Dego wrote, 'To bear witness to man's history in all the urgency of a particular time and place, and to teach the lesson of courage, this has been Quasimodo's poetic task.' Jack Bevan (1920 – 2006 ) was born in Blackpool and read English at Cambridge before being conscripted into the Army, where he served with the Gunners as a commissioned officer in Iceland and Italy. He fought in the Italian campaign during the Second World War, and after the war returned to Cambridge. His subsequent career was in education as head of a number of departments in teaching and teacher training. During this time he also worked intensively on the translation of contemporary Italian poetry, in particular that of Salvatore Quasimodo. 'The poetry is textured like shot silk, yet the elegance and syntactical lucidity with which Jack Bevan has worked to bring these poems to English readers enables them to stand as poems in their own right' - Peter Scupham on Bevan's translation of Quasimodo's last poems, Debit and Credit. Jack Bevan (1920 – 2006 ) was born in Blackpool and read English at Cambridge. He fought in the Italian campaign during the Second World War, and after the war returned to Cambridge. His subsequent career was in education and during this time he also worked intensively on the translation of contemporary Italian poetry, in particular that of Salvatore Quasimodo. Salvatore Quasimodo (1901–1968) was an Italian poet and novelist who won the Nobel Prize for Literature in 1959. During the 1930's Quasimodo was a leader of the "Hermetic" school of poetry, however his later works chart his change from individualism toward sociality.